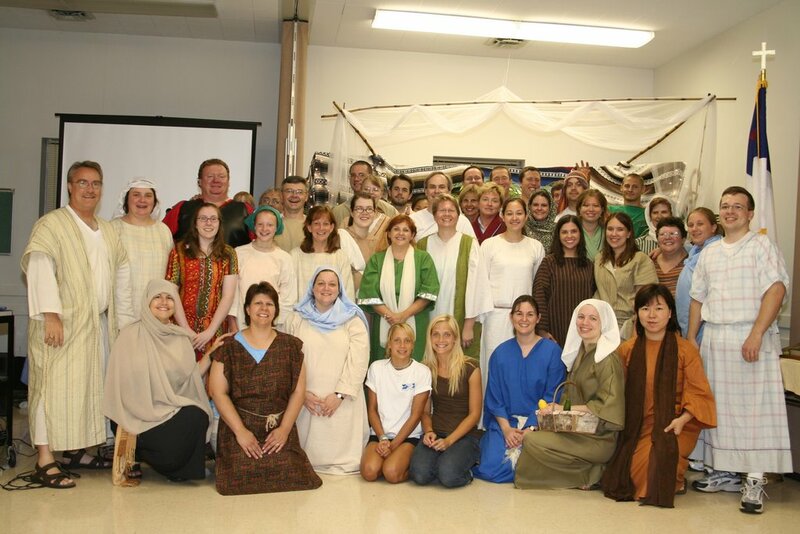 stylos: Jefferson Park VBS 2006: "Bethlehem Village"
Jefferson Park VBS 2006: "Bethlehem Village"
Pictured above is part of the JPBC team of youth, students, and adults who have made our 2006 Vacation Bible School work. Despite extremely hot weather in central Virginia we have had an excellent VBS thus far and have ministered to scores of children from our community. We are using the Group "Bethlehem Village" VBS that centers on telling the Christmas story. The children are divided into the twelve tribes of Israel. Children of various ages (from preschool to grade 6) are in a tribe together with youth and adults leaders. I think this "intergenerational" concept has worked great. It seems when kids are grouped only with children of their same age, they can compete with and pick on each other. This year it has been great to see older children enjoying being with and helping the younger ones. Of course, we have done it all in costume. It is also interesting to see how the children begin to identify with the Israelites and resent the "Roman" characters/leaders. One of the best things about VBS, of course, is just the fellowship and "shared experience" we all enjoy in working together in ministry. Our VBS directors, Melia Hatfield and Stephaine Glass, both elementary school teachers, have done a great job in organizing this event. I don't know if I would consider having some older kids with some younger kids really "intergenerational". They all really come from the same generation. When it comes to Sunday School, the "intergenerational" concept is a different story. However, if this church is to be a true "intergenerational" church, then EVERYONE in the church needs to be included. Just some food for thought.